The experienced team at Poolworx offer a full swimming pool refurbishment service throughout East Anglia including Essex, Hertfordshire, Suffolk and Cambridgeshire. If your swimming pool needs refurbishment or updating, we can suggest options and provide plans for modification and modernisation. We can retro-fit heating, filtration, lighting, and swimming pool covers and also suggest ideas for the surrounding area. 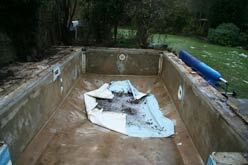 We can apply our years of expertise so that you can enjoy your pool again.